A student with deafblindness is one who has a combined loss of vision and hearing, such that neither sense can be used as a primary source of accessing information. 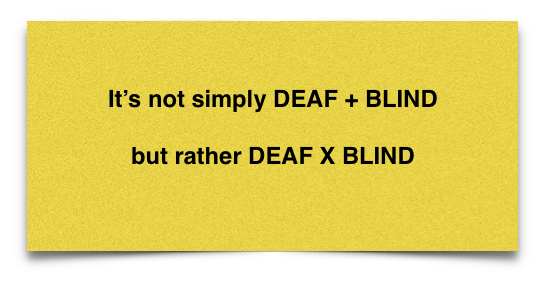 Therefore, deafblindness is considered an information-gathering disability. The student with deafblindness requires specialized support to meet his/her educational needs beyond those that would be provided for students with solely vision loss or hearing loss or severe disabilities. With this support in place, the student with deafblindness is able to benefit from integrated school and community programs. nor a student with hearing loss who cannot see. Deafblindness is a unique disability. Intervention is a process that allows an individual who is deafblind to receive visual and auditory information that s/he is unable to gather on his/her own. This process must be meaningful to the individual with deafblindness, so s/he can interact with his/her environment. Intervention enables the person who is deafblind to establish and maintain control over his/her life. An Intervenor is a professional who provides Intervention services to an individual who is deafblind. University of Toronto Press, Toronto. For more on the Role of the Intervenor, click here. For Tips on Getting Started, click here. For the Canadian Deafblind Association Principles of the Concept of Intervention, click here. Also, be sure to check out the Intervention Essentials under Resources, click here.